Hockey dreams took a major stride forward on Saturday as OMHA players were chosen in the Ontario Hockey League’s Priority Selection, including seven in the first round and the top two picks. 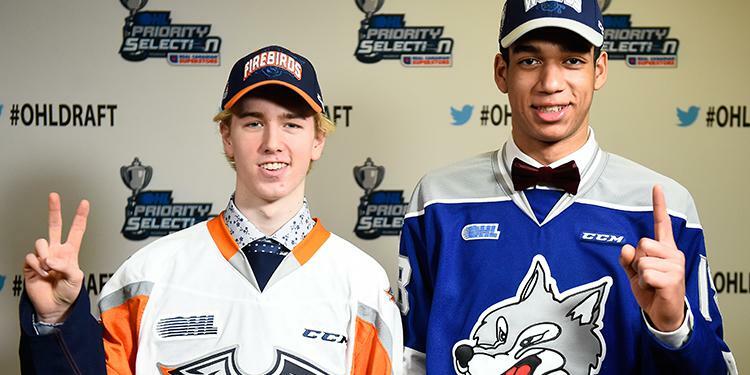 Quinton Byfield was announced as the first overall pick in the draft, heading to the Sudbury Wolves. The 6’4”, 203 lbs. forward is described by OHL Central Scouting as an intimidating presence on the ice with exceptionally high skill level and can do things with a puck that not many players his age or size can do. Byfield led all Minor Midget players in scoring this season, netting 48 goals and adding 44 assists across 34 games. Looking good in the Nickel City! @Sudbury_Wolves announce Quinton Byfield will be the first overall pick in the 2018 #OHL Priority Selection presented by @RealCdnSS. The Newmarket native has won three OMHA Championships in a row, culminating with a gold medal in the Minor Midget AAA final game. The 15-year-old also captained his team to a semi-final finish at the OHL Cup last month. As the first player selected in the OHL Priority Selection, Byfield is presented with the Jack Ferguson Award. The most recent recipients of this award from the OMHA include Dan Catenacci in 2009 (also from the Express) as well as Steven Stamkos (Markham Waxers). You can see the the full draft results here. The second overall pick in the draft was Evan Vierling who went to the Flint Firebirds. Vierling and Byfield were teammates on the Express and went back-to-back. Vierling’s attention to detail is outstanding; defensively he takes away time and space from the opposition and creates turnovers. He has a high compete level and wants to make a difference every time he is on the ice. 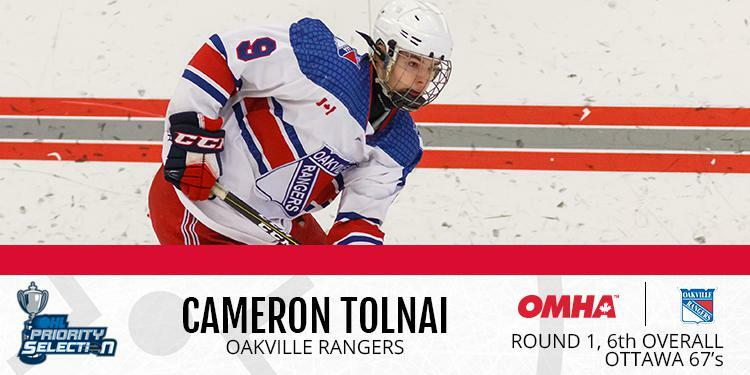 Going sixth overall was forward Cameron Tolnai of the Oakville Rangers who heads north to the Ottawa 67’s. He is a good-sized winger with elite level skill and hockey sense and sees the ice and distributes the puck well. Tolnai has fantastic hands and opposing players need to be aware when he is on the ice. “I am very ecstatic. Getting drafted in the Ontario Hockey League has been a dream of mine for a long time and to get selected by a team like the Ottawa 67’s is something that I am very thankful for. I have to thank my parents for all the time they have put in to my minor hockey. From getting up early and driving me to practices and games all these years, they have always been there for me. I am going to spend the off-season working on getting bigger and stronger and can’t wait to get going." 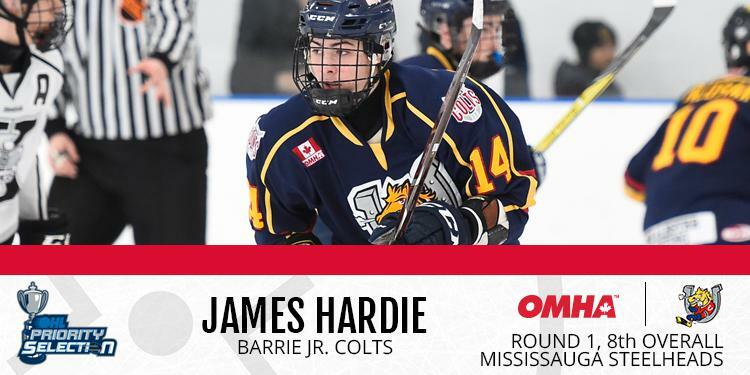 James Hardie of the Barrie Jr. Colts went eighth overall to the Mississauga Steelheads. The forward knows how to read situations and teammates in offensive zone well, allowing him find the soft areas that make him dangerous. Hardie also has the ability to gain the offensive zone off the rush where he can rely on his stick-handling ability to open up a shooting lane. 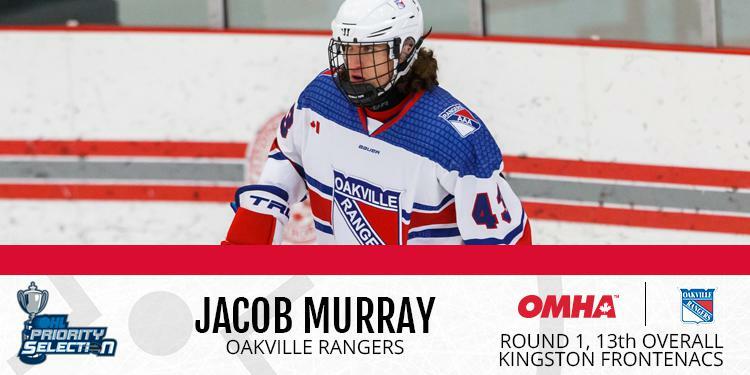 With the 13th overall pick, defenceman Jake Murray heads to the Kingston Frontenacs. He is able to carry the puck out of trouble or jump into a rush to be an option for his forwards. When he is in the offensive zone, other teams will have to keep an eye on where he is as he likes to move into areas to become a passing outlet or to unleash his shot. 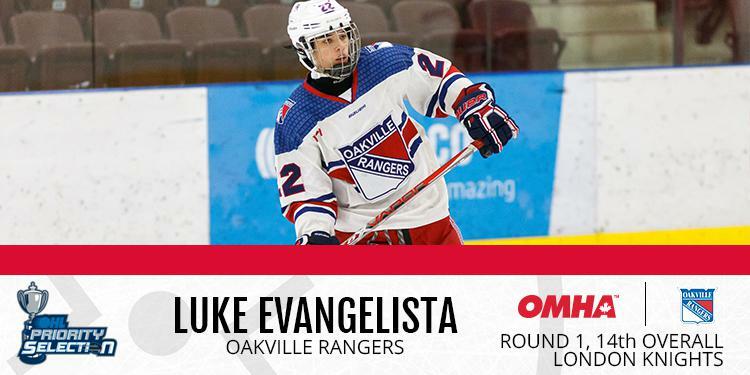 Teammate Luke Evangelista went next in the draft, going 14th overall to the London Knights. Evangelista knows how to open up passing lanes, when to be patient, and when to be explosive. With his confidence, his head is up reading defenders and more importantly seeing where his teammates are. Evangelista then lets his offensive instincts take over and he will creates prime scoring chances, which consistently get him on a score sheet. 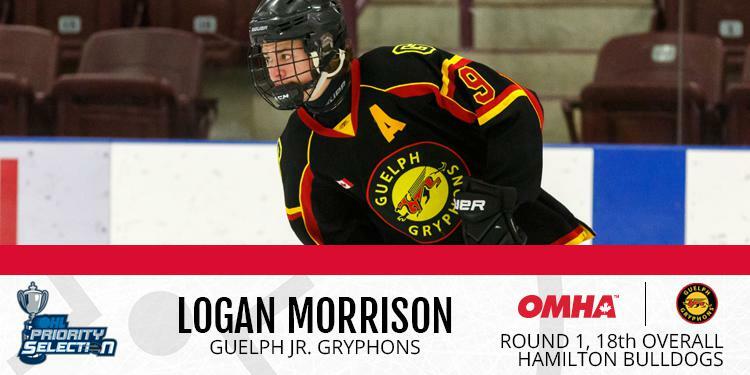 Rounding out the first round from the OMHA was Guelph Jr. Gryphons forward Logan Morrison, who heads to the Hamilton Bulldogs with the 18th overall pick. His tenacity allows him to create a lot of turnovers. Morrison's hockey sense can then take over when he has the puck on his stick. He can make a skilled play to generate space for a shot or to create a passing lane for one of his linemates. The Ontario Minor Hockey Association led the way with 84 players selected from 20 teams. 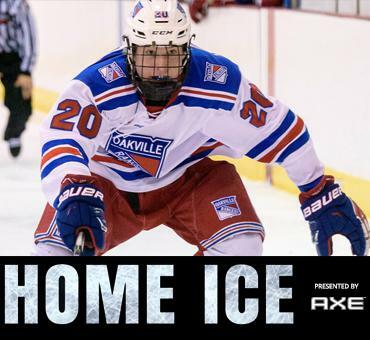 The Oakville Rangers led the OMHA and the entire draft with 14 players selected, followed by the Peterborough Minor Petes with 10, the Barrie Jr. Colts with eight, both the Guelph Jr. Gryphons and Niagara North Stars with seven and the champion York-Simcoe Express with six. See a full list of all the OMHA players chosen at the bottom of the page. Player development is a key component of the OMHA experience. The OMHA conducts a wide range of clinics for players, coaches and other volunteers to improve their skills and enhance their overall experience and enjoyment of the sport. OMHA boasts a long list of grads who earned their place in the NHL from Taylor Hall to Travis Dermott to Drake Caggiula.